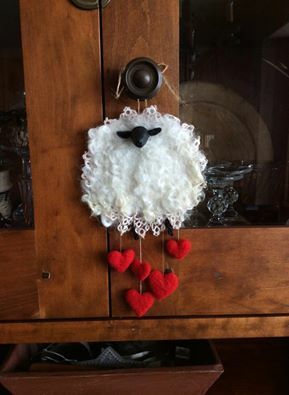 A quickie little project to decorate your home with love this Valentine’s Day. 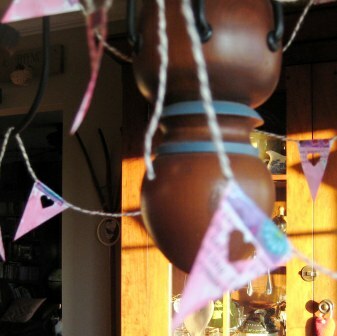 I made this wee little heart pennant bunting to grace my light over the kitchen table. I’m nutz about this ‘holiday’. 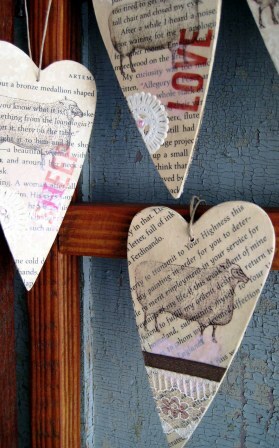 I cut little pennants from an old book page… a romance novel to be exact (hee hee). You could use ANY decorative paper, gift wrap, tissue paper – even colorful fabric scraps! 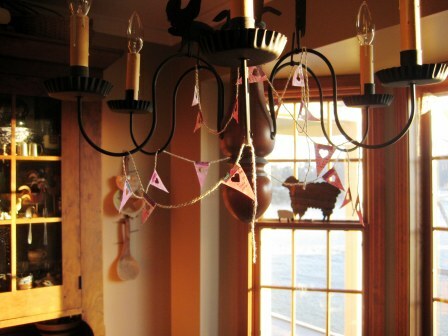 Then, I used a heart punch to cut-out little hearts into each paper pennant (this may be difficult w/fabric). Next, I used a decorative tape (have you seen the large assortment in the crafts store scrapbook section?) 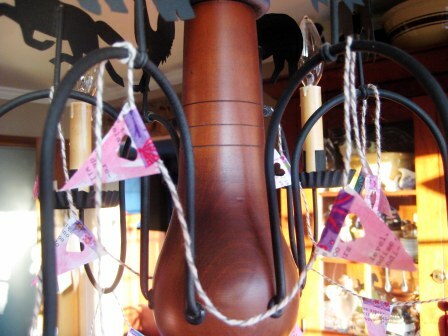 to secure each paper pennant to a bit of baker’s twine – or yarn, or string… whatever you have on hand. You could also use a dab of glue. The idea is no fuss! Keep in mind, the scale of your project when you choose your twine. Last, I added a quick brush-stroke of water color ( I ♥ water color paint) to ‘pretty’ the pennants. Ta Da! Perhaps you can get the kids involved to help! This would be sweet to send to a friend in a love-note (via old-fashioned snail mail) to brighten their day… don’t you think? I don’t know where this week has gone? 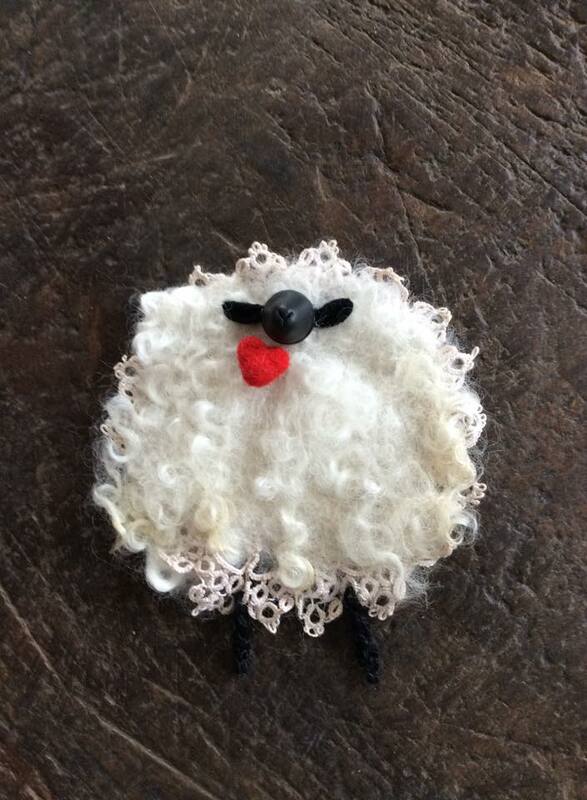 Just kind of flew by… I’ve been busy, but don’t seem to have much to show for it! 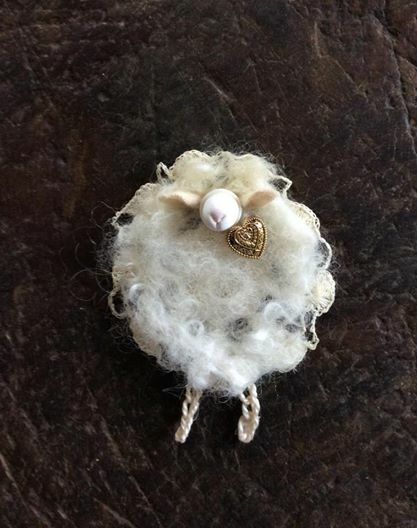 (I’ve been working on another 3 dozen ‘soap in sheep’s clothing’ (aka felted soap!). 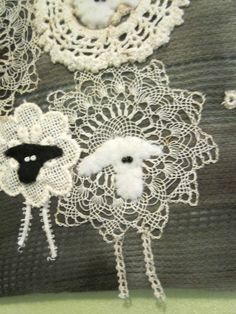 I’m hoping, even if you don’t have a ‘thing’ for sheep, you might take away some ideas/inspiration and apply it to your own ‘thing-y’ WHATEVER that may be?! 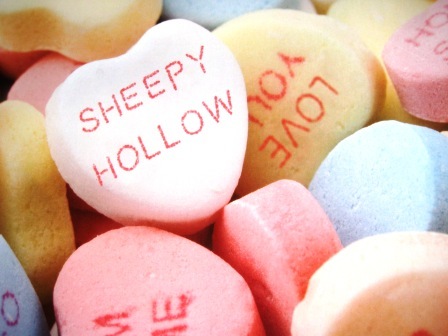 I’ve been hopelessly smitten by St. Valentine’s Day bUg since our XMas decorations came down. I made a few more ♥-shaped ornies. You don’t have to be a serious scrap-booker to make these ornies. 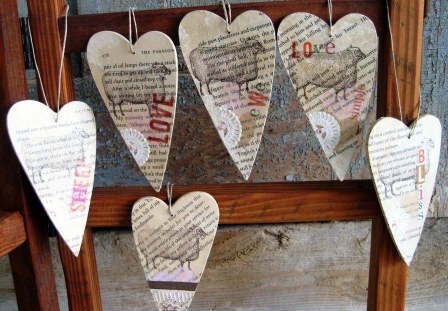 I was actually re-organizing a drawer of bits when I found some wood heart cut-outs (available at most craft stores). You could make ANY shape ornie from card stock. I decided to use book pages from an old romance novel (it seemed apropos) and stained/aged them with coffee. (To give a vintage look to paper, spritz with a strong solution of instant coffee; place the paper on parchment paper in the oven on the lowest setting to dry. Once dry, you can iron the paper if you’re planning on running it through the printer.) Or, you could use sheet music or any decorative craft/wrapping paper. 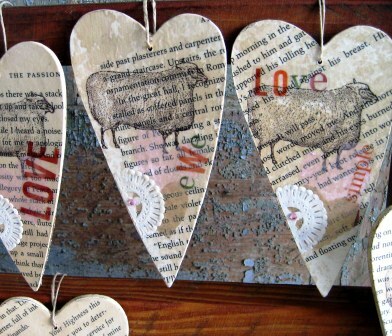 Trace the heart onto the paper and cut it out… I also stamped a sheep onto the paper. 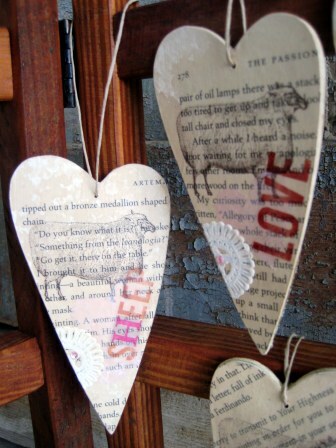 Next, apply a coat of Mod Podge or dilute white craft glue to the wood heart and neatly place the paper onto the surface. Carefully smooth and remove any air bubbles. 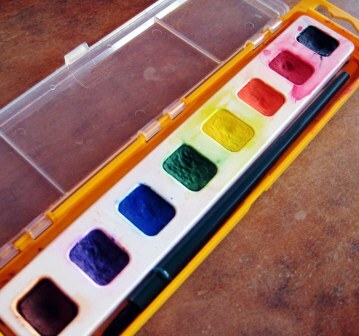 Apply another thin coat to the surface of the paper to seal. 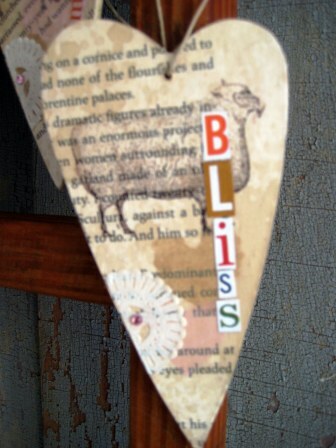 I used ‘letters’ cut out from old magazines for little messages: love, ewe, bliss, etc. Some I cut and pasted; others, I used packaging tape to transfer the ink image from a magazine page onto my ornie. 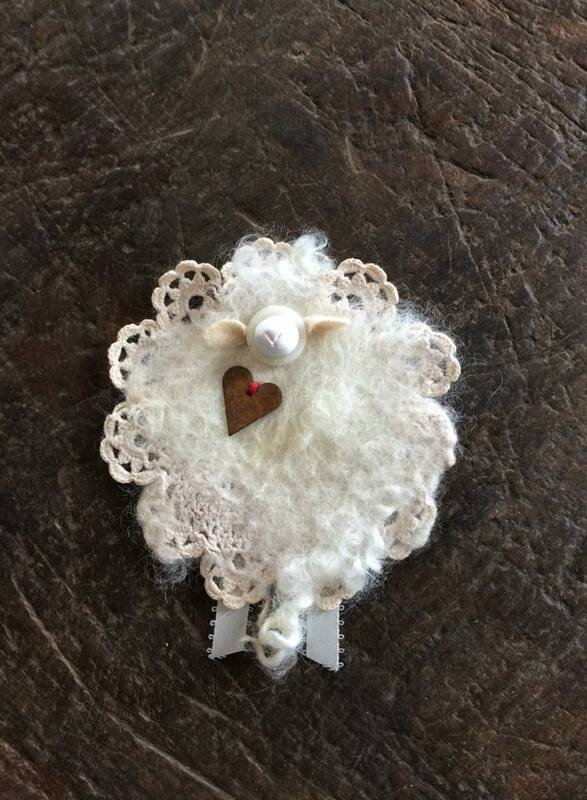 I wanted simple & prim: ornie, gift tag, garland… for the sheep lover & fiber enthusiast. I drilled a hole at the top and added a piece of twine to hang! I think this would be a fun project for the kids too!